Namul is a general term for a Korean seasoned vegetable dish. The name of the dish may vary slightly depending on what vegetables are used and how they are prepared, but they will nonetheless still be a type of namul. Left: Namul made of sauteed soybean sprouts, bracken fern, spinach, daikon. Virtually any type of vegetable, herb, or green can be used, and the dish include roots, leaves, stems, seeds, sprouts, petals, and fruits. They can be prepared as a single type of namul, or they can be mixed. The method of preparation can also vary; they may be served fresh (raw), or boiled, fried, sauteed, fermented, dried, or steamed. Seasonings can also vary. Namul can be seasoned with salt, vinegar, sesame oil, and even gochujang (Korean red pepper paste). Namul are typically served as banchan (a side dish accompanying the main course). It is possible to have more than one type of namul served as a banchan at a single meal. 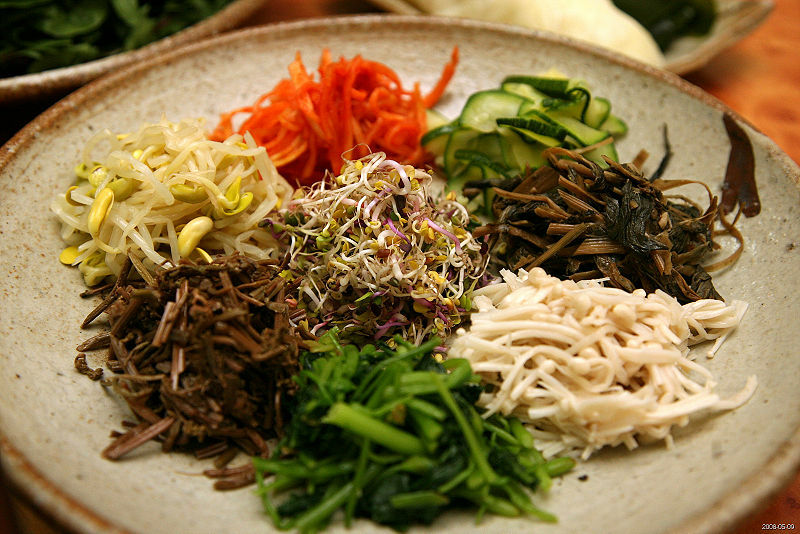 A few examples of namul include chwinamul (wild leafy plants), hobaknamul (made from hobak, a Korean squash with green skin and orange flesh), shigeumchi (spinach), and kongnamul (soybean sprouts).